Page Master Designs Online: Buttons, buttons and more buttons! Hey everyone I...AM...BACK!!! Sorry for the hiatus but I so needed it. I really enjoyed the 4 weeks I had to spend with my children. This is our last short summer. My daughter will be a regular calendar school next year and no more year round. My family will get to enjoy full summers rather than cramming an entire summer into 3 weeks! I have missed stamping and I am so glad that I get to come back with a new A Blog Named Hero Challenge. This week it's all about....BUTTONS! Yep, buttons!! I have been in a rainbow mood as of late. We have seen a couple really beautiful ones this year and we also got to experience a double rainbow right over our house for what seemed like eternity. It was SO cool. Everyone came out of their houses in our neighbor to just stand and stare in silence. It has become a favorite summer memory this year. I started this card off by using the new Hero Arts stamps from the stamp your story line. I inked them in bright colors and then added a coordinating button on each one. I have wanted to do this since I first saw that paint swipe stamp. This card is for a teen girl. I wanted something cheery and honestly my button draw is overflowing so I needed a way to use some buttons. I had originally cut the rainbow out to ink it but decided to add the buttons instead. It's really hard to tell but I colored the clouds with my Wink of Stella clear glitter pen and it looks so pretty in person. The camera kind of makes the clouds look like storm clouds...but in person it's just sparkly! Make sure you head on over to A Blog Named Hero to see what the other girls have done and read the rules to enter the challenge. 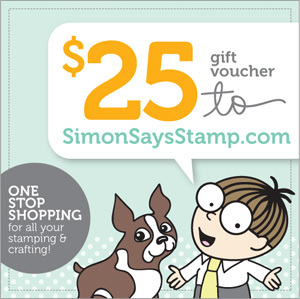 As always we have a fab $25 GC from the most generous Simon Says Stamp up for grabs. They are both gorgeous friend! Ihad to laugh because I wanted to do the same thing with those paint swipes hehe :) Great minds think alike! two beautiful cards with all the rainbow buttons!